Michelle Fields files assault complaint against Corey Lewandowski. 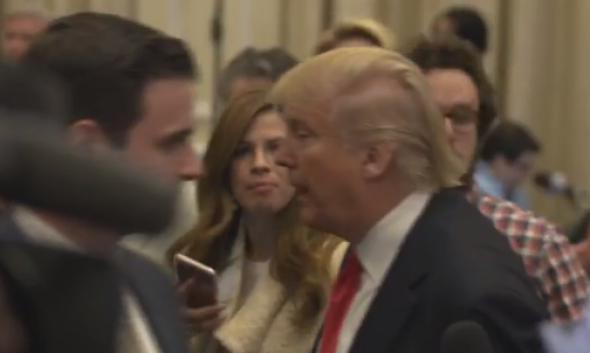 From an MSNBC video of Michelle Fields speaking to Donald Trump on Tuesday night shortly before she’s apparently pulled backward out of the camera’s frame. Michelle Fields has filed a criminal complaint against Corey Lewandowski, the campaign manager for Donald Trump. Independent Journal Review has learned from a source familiar with the events that Fields has filed assault charges with the police department in Jupiter, Florida, which is the jurisdiction where the alleged incident occurred. The Jupiter police department has confirmed that an investigation of the Tuesday incident is underway but did not name Lewandowski as a suspect. Fields says she was grabbed forcefully and pulled away from Trump as she tried to ask him a question after a Tuesday night press conference. Washington Post reporter Ben Terris has identified Lewandowski as the man who grabbed Fields. There are a lot of claims and counter-claims involved in this story. Here’s what we know. As security parted the masses to give him passage out of the chandelier-lit ballroom, Michelle Fields, a young reporter for Trump-friendly Breitbart News, pressed forward to ask the Republican front-runner a question. I watched as a man with short-cropped hair and a suit grabbed her arm and yanked her out of the way. He was Corey Lewandowski, Trump’s 41-year-old campaign manager. … Sources said Lewandowski acknowledged to Breitbart’s Washington political editor, Matthew Boyle, that he did manhandle Fields. Video from Tuesday shows Terris speaking to Lewandowski a moment after Fields appears to be pulled backwards but also shows another security staffer in the vicinity who resembles Lewandowski. A different Breitbart writer (! ), Joel Pollak, published a post Friday morning suggesting that Terris could have misidentified Lewandowski as the person who grabbed Fields because Lewandowski resembles an as-yet-unidentified security official who was also standing next to Trump. Terris, however, can be seen in the video speaking to Lewandowski immediately after Fields appears to be pulled backward out of the camera frame, and Politico has posted a transcript of an audio recording of the incident in which Terris seems to identify Lewandowski as Fields’ assailant. To sum up: No direct visual evidence has yet emerged that shows Lewandowski grabbing Fields. But Terris seems to have identified Lewandowski as the individual who grabbed Fields within moments of the incident taking place, while a published report says Lewandowski has admitted in a private conversation that he did do what he’s been accused of. What’s almost certainly not true is Donald Trump’s suggestion that Fields made the whole thing up. Update, March 11, 4 p.m.: A video posted by CSPAN shows Lewandowski—but not the other security official who resembles him—reaching toward Fields as she follows Trump after the Tuesday press conference.